Hello all!! I have a short post today. It’s about an unexpected favorite that’s been hiding in my stash for the longest time! Let’s get right into it. This shade is Icing Something Blue. It’s a blue-toned periwinkle with a fairly strong silver shimmer, similar to Essie’s Bikini So Teeny. There’s something about this that’s colorful and fun, yet understated and classy. The formula was great as well; it was a little streaky but very opaque in one coat, and covered fully in two. It’s also the perfect forget-me-not blue! These dainty li’l guys have been my favorite flowers for a long, long time. The moment I realized that Something Blue was their perfect color match, I had to slap it on. Can you believe I’d never seen forget-me-nots in person before spotting them while visiting my local arboretum and taking this picture? And that’s all I’ve got for ya this time around! Do any of you have any polishes that make you think of flowers? Hello again! I hope everyone’s week is going well so far. I don’t have much today, let’s get right into the swatches! Let’s start with one super opaque coat of China Glaze Up All Night. I’ve worn this before as part of a more complex manicure, but I’d yet to swatch it on its own until now. It’s an incredibly dark inky blue, with a cobalt shimmer that makes it look lit from within. I added Icing Aspiring Mermaid, a bright aqua shimmer, on top. I’d intended to layer this for an extra shimmery effect, but Aspiring Mermaid ended up being more opaque than I’d originally thought, and too streaky to layer with. This is three coats on top of Up All Night. The under layer was definitely not necessary, haha. Two of my closest friends got married on the 3rd of this month! In honor of their Medieval-themed ceremony (the bride is a Medieval History major! ), I did a manicure inspired by illuminated manuscripts. I love how my ring finger looks so much smoother than the rest of my nails. That’s because it’s super fake. haha. Sigh. It’s so lavish looking! 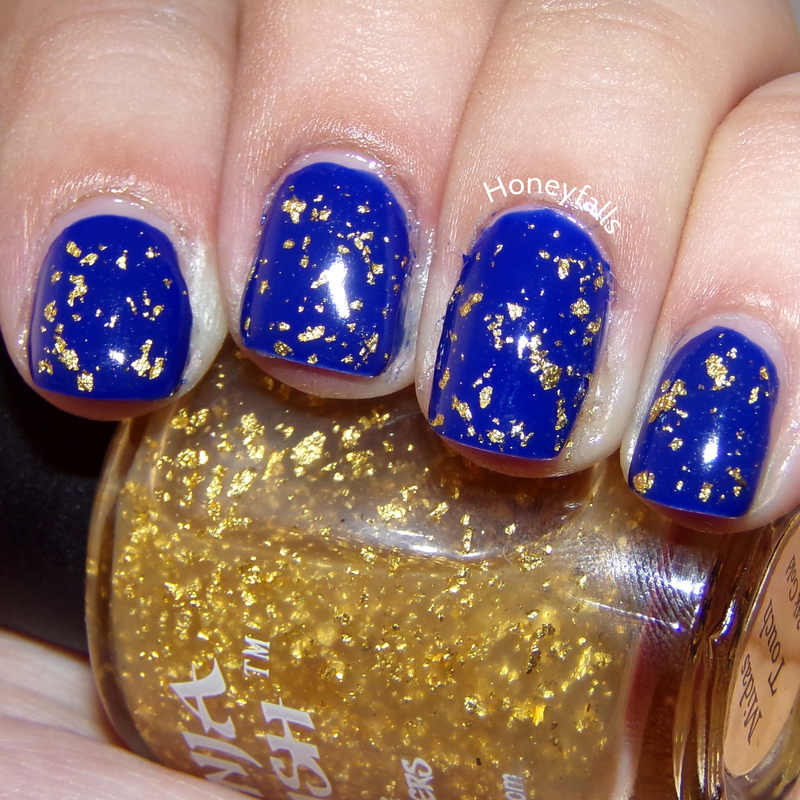 I couldn’t stop staring at my nails, the gold combined with the bright cobalt blue was a sensory overload, haha. Of course, this would be too loud to wear at the wedding. Still rockin’ that fake ring fingernail here, with an additional fake index fingernail because I had another really bad break and refused to go to this wedding sporting nubs. But yes, these are all my wedding-related manis from the last month! Hope you guys enjoyed them, and sorry for the longish silence. It won’t happen again. At least not soon. You know, probably. You can get Kiko’s nail polishes from their website, and Midas Touch is still in stock!!! over at Ninja Polish’s online store. Take THAT, weather! It was supposed to rain all holiday weekend—joke’s on you! It’s totally nice out! Since there was decent lighting today, I decided last minute to do some nail art (my first attempt!). 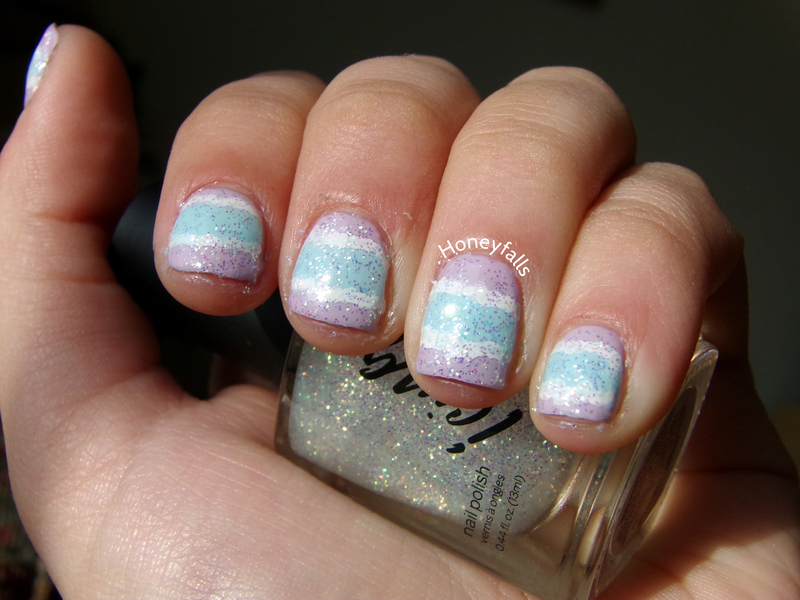 I wanted to make my nails look like some kitschy dyed glittery Easter eggs, haha. I started with two runny coats of Hard Candy Prep Squad. Luckily it evened itself out. Then I used a nail art brush and painted a stripe of Hard Candy Sweet Retreat. I went over it a second time to make it more opaque. Some tiny dabbing motions with a Sally Hansen I Love Nail Art pen made the white lines. Pink Frost is interesting. It’s fleshy pink in the bottle, but it’s sheer and adds a cute frosty blue shimmer to whatever base color you put it over. I imagine it’d simply show as blue over a black base, much like Maybelline Color Show Crystal Disguise, only with more uniform coverage. I have a few polishes that look one color in the bottle and look totally different when layered. I think I’ll make a master post of all of those one day. It’d be a fun little experiment.